A little while ago now the lovely Peonies and Lilies asked if anyone would like to do a guest review on her blog of some products she had been sent by Max Factor – Of course I jumped at the chance- I must admit Max Factor is a brand that I have pretty much ignored – I love the False Lash Effect Mascara but other than that I haven’t tried that much from them so this was a fabulous opportunity for me to try 3 new products from their new Max Effect range. One of their newest introductions is the Dip in Eye Shadow. I’ve used similar products by other brands before so the concept was pretty familiar to me. Essentially you get a vial of loose powder shadow and a sponge applicator to dip in and apply it with. I like the idea of products like this in theory you don’t need an extra brush to apply it so they are quick and easy to use. Well that’s the theory anyways, whether it was the colour, a slightly flat shimmery bronze or the consistency of the product I don’t know but it had a tendency to look too thick or overdone when I just used the applicator, I also found it difficult to get a really precise application. 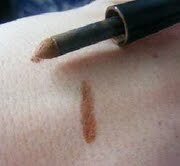 The best way to use it I found was to apply the product with the applicator and then to blend it out with a brush, but like with all loose powder products you need to watch out for a bit of fallout. 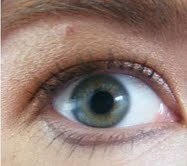 You can see here two looks that I created with this product first of all I used it on its own as I say the colour is a bit flat, it has some shimmer in it but it does tend to look a little bit orange toned. 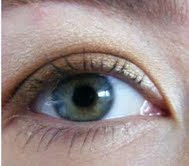 Then I used it just as a crease colour, with a neutral, shimmery shade all over the lid. I much preferred this way of using it, because of the darker colour you could use it to define and shape the eye. It also blended well with the other colour and lasted pretty well without much creasing. Thanks again to Louise for the review and swatches, and look out for part 2 of her reviews which will be up later in the week! Nice colour (^_^) I've never try this product.